Lead acid batteries come in a variety of types and the most frequently used ones in homemade electric cars are tubular deep cycle batteries designed to hold the electric charge for prolonged periods without the necessity of renewing their charge by trickle or regular recharging. This especially suits their use in electric vehicles (EV) which are not used on a daily basis. However, since they also contain liquid electrolyte in the form of dilute sulfuric acid, they need continuous maintenance. When they do finally fail or show signs of failing, their replacement costs are high and it is therefore economical to get them reconditioned at much lower price. Reconditioning technique in the case of deep cycle batteries is not very difficult to master and one can attempt to do it as a DIY project, if the right tolls and knowledge is available to you. One of the first requirements is to get a suitable external multi-phase battery charger of the right capacity. You would also need accessories like vice grips, crescent wrench, steel wool, glass funnel, bucket and protective rubber gloves. Certain chemical materials like baking soda, distilled water and Epsom salt are also needed. Once all these are ready, we can start by following the below instructions meticulously. First, the external battery container needs to be checked thoroughly for any cracks or signs of leakage. If any leakage is detected, avoid touching the battery with bare hands and ensure rubber gloves are used for the task. Disconnect the positive and negative leads connecting the terminal to the battery and remove the battery from its holding compartment. The battery housing and the terminals are to be thoroughly cleaned using a paste of baking soda and water to remove any traces of acid. Wherever necessary use steel wool to apply the paste. Now remove the plastic breathing plugs on top of the battery and carefully drain the cells into a bucket without spilling. Certain brands of batteries are sealed and come without screwed plugs, but may have soft depressions on the top. Drill these with a ¼ inch drill to open them and drain the electrolyte. Make a solution of eight ounces of Epsom salt in a quart of distilled water, without leaving any crystalline residue, stirring vigorously if required. Using the funnel pour this solution to fill up each cell and recap them when plugs are available or in cases where holes were drilled to drain the battery, use rubber plugs easily available in most auto parts shops. Now connect the battery to the multi-phase battery charger using appropriate clips. Since deep cycle batteries take longer duration for the charging process, avoid using the “quick start” feature if provided in the charger. Once the battery is fully charged, remove it from the charger and reconnect to your vehicle in the normal way. Try to keep the charge by driving around slowly for a few minutes at a time. During the next few days inspect the battery regularly and repeat the charging process if required for full long duration charge. Adequate precautions like avoiding the reconditioning procedure in enclosed small spaces, wearing of safety eye glasses and use of rubber gloves will go a long way in ensuring safety. Do you want to know how to save cost on your DIY electric car conversion project by reconditioning old deep cycle batteries? 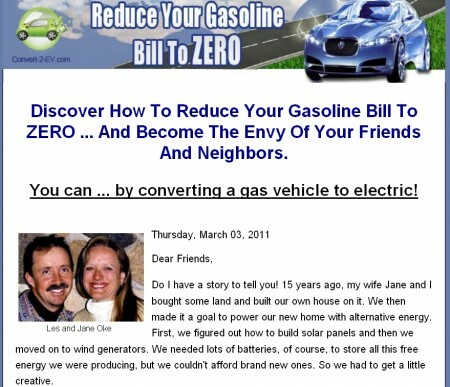 If you do, check out the Convert2EV guide book by Les and Jane Oke. The Okes have been living a green lifestyle for more than 20 years. One way to reduce their carbon footprint is to drive a homemade electric car. The Convert2EV ebook was written based on their personal experience retrofitting conventional automobiles into EVs on a small budget. Click on the link below to visit the Oke’s web site now.